Authors are required to upload the manuscript as Microsoft Word file (.doc or .docx). Set margins at 3 cm, top, bottom and sides. Abstract should be no longer than TWO pages in length (including any graphs and figures). Use Arial font. Character size: Title, 14, bold and centred. Type title in upper and lower case, standard title format. Authors, affiliations, email and text at a size of 12 points. Presenting author in bold. Group authors by affiliation. Type affiliation below author lines. Include ONLY the affiliation name, city, state and country in abstract listing. Type body single spaced without any indents or tabs. Double space between paragraphs. Apply bolding, italics, underlining, superscripts and subscripts in your main text as you want to appear in your final abstract. Full main address at the bottom of the abstract and email address of the corresponding author. All abstracts should be written in English. 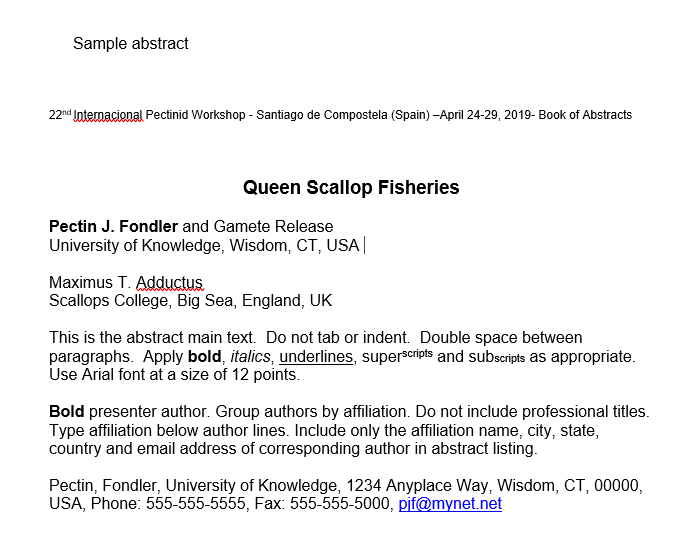 The Abstract File Name must contain your first and last name as in the following example: "Pectin_Fondler_Abstract.docx"
Your abstract will be reviewed by the Organising Committee and you will be informed about the acceptance of it shortly after submission. All student presentations, both oral and poster, will be entered into the Student Presentation Competition (Student must be the first author and presenter). Indicate "X" if you are a student, are the senior author and will be presenting the paper. All student presentations, both oral and poster, will be entered into the Student Presentation Competition.